In preparation for the launch of the Ethfinex Portal — our trustless, non-custodial Ethereum-based trading portal — we have put together a recap of how our Hybrid Exchange Model will work, linking together a centralised exchange on one side and decentralised trading portals on the other. The primary use of the term decentralised exchange refers to a platform not requiring centralised custody of funds, or the trust of a third party in arbitrating trades and disputes. Decentralised exchanges do not store coins, funds, private keys or user information on centralised servers, thereby making it increasingly difficult for unaffiliated parties to compromise sensitive information. At Ethfinex we also subscribe to this vision of decentralised exchange and are striving to create a truly trustless trading experience for our users. The true potential of blockchain technology is a product of decentralisation, and the idea that exchanges should be exempt from this is illogical given the vulnerabilities associated with centralisation. To facilitate the development of trustless, non-custodial exchange, Ethfinex will pioneer a hybrid, decentralised model for Ethereum-based exchange. Our goal is to act as an “incubator”, creating an experimentation zone whereby decentralised exchange protocols can implement, test and optimise their systems, continuously learning and growing with Ethfinex’s liquidity pool. This approach to decentralised exchange allows Ethfinex the possibility to be agnostic of technology, to experiment and collaborate with innovative models of decentralised exchange, as and when they emerge, and to implement blockchain solutions where they offer an improved trading solution. Our hope is that this will accelerate the learning process for new decentralised exchange projects and lead to the development of optimal decentralised exchange tools and protocols. Traders who value the high speed, financed trading capabilities, sophisticated features and the user experience of a centralised exchange can use Ethfinex in the way that they currently use any other centralised exchanges, benefitting from the additional liquidity provided by decentralised users. 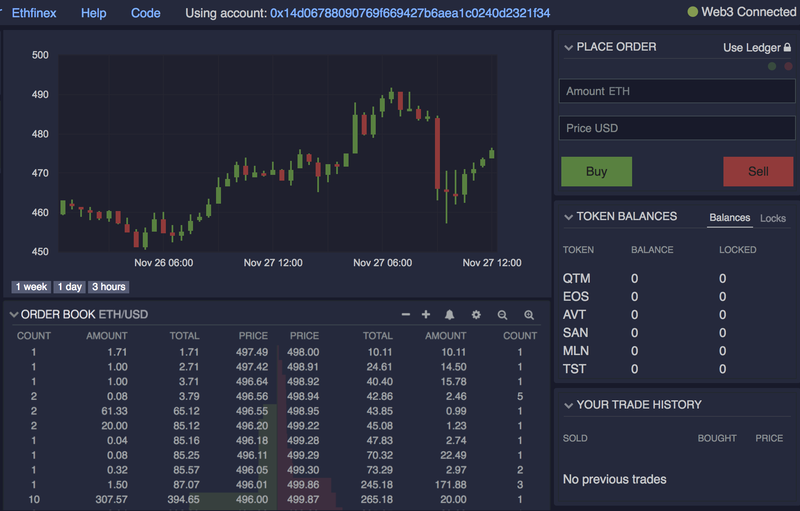 A set of APIs will be made available to provide an interface which will allow any decentralised exchange protocol to trade with the Ethfinex order book, and with each other. Decentralised exchange users can trade with a large liquidity provider without creating an account with Ethfinex or giving over custody of their funds to a third party. Ethfinex therefore propagates the liquidity of our users to make it available to these users, and for other Ethereum-based projects with requirements for on-chain exchange settlement. The Nectar token is integrated into the interface between the central exchange and remote trustless exchange portals to incentivise on-chain liquidity providers who trade with Ethfinex by rewarding them also with Nectar tokens. This hybrid exchange model has its own challenges to overcome when compared with fully decentralised exchange, however, including risks of front-running and dual execution. In addition to these challenges, the speed and complexity requirements of the most sophisticated trading customers mean that practical implementation of fully decentralised matching and settlement on-chain still requires further development. Furthermore, margin trading, involving a peer-to-peer financing market on blockchain, is a further challenge that is as yet unsolved, but is essential to attaining large scale and liquidity. These are the challenges we are most focused on overcoming, and where the majority of our research is targeted. Our first major area application of a blockchain solution will allow for on-chain trade settlement, without custody of funds, through Ethfinex Trustless. Ethfinex Trustless will enable non-custodial trading, giving users remote access to the Ethfinex order book, via MetaMask or a Ledger Nano S, and using the same messaging format as the 0x protocol. This allows users to settle trades on the Ethereum blockchain without needing to deposit their funds, maintaining complete control throughout the entirety of the trading session. The Ethfinex Portal is currently undergoing testing and will be made available during the Ethfinex beta. Our first solution will provide trustless on-chain liquidity by allowing anyone to trade without losing custody of their funds, against the orders placed by users of the centralised half of Ethfinex and have them settled via a set of smart contracts on the Ethereum blockchain. We recognise that there are steps between this and full decentralisation; however, this is a major step forward towards our goal.We are looking forward to sharing a full update on the Ethfinex Portal, the technology behind it and how to use it. We will also be sending out a major update on the rest of the development progress to our mailing list later this week.